Economy Palletised Freight | Premium Palletised Freight | PC Howard Ltd . Whether you are looking for a fast efficient service or can wait a little while, we offer palletised freight delivery options to suit your individual requirements. 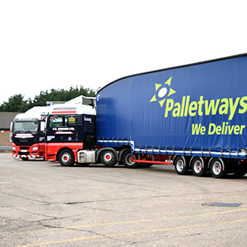 Palletways offers Premium and Economy palletised freight delivery options which are essentially a next day service or a 48 / 72 hour delivery service. With the Premium Service we collect the goods from you one working day and deliver the next working day . The economy service gives us more flexibility for delivering the pallets, with delivery being achieved on either the second or third working day – depending on where it is going. Palletways produce a Delivery map , which gives the service that they offer in each area of the Country . In essence the further you travel from the hubs the time required to achieve a premium service increases. This service can allow you to take orders during the afternoon and for your goods to be delivered the following morning.